This is a reminder that my colleagues Louise North, Landa Freeman, and I will be giving a PowerPoint presentation at the National Historic Park in Morristown, New Jersey, on August 16 at 1 pm. It will focus on the lives of women during the Revolution and afterwards, using material from our book In the Words of Women. This site commemorates the encampment of George Washington and his troops during the winter of 1779-80, the coldest on record. Excerpts from Louise North’s latest book The Travel Journals of Henrietta Marchant Liston, the wife of the British ambassador to the United States from 1796 to 1800, will be included. The talk will be followed by Q & A and our book will be available for sale and signing. Do consider attending. Henrietta Liston was keenly aware of George Washington’s importance as a key figure in America’s history. (See post.) When he voluntarily resigned his office, Mrs. Liston commented on what the reasons underlying that decision might have been. On the third of March , it being the last day of General Washington’s power as President, he gave a publick dinner to the officers of the State, Foreign Ministers principal Senators, & to their respective Ladies. I had, as usual, the gratification of being handed to Table & of sitting by the President. Had I never before considered the character of Washington, I should certainly have joined the general voice, & pronounced him greater in this voluntary retreat, & in the resignation of power over an immense country, than when, having by his conduct as a Soldier, been the principal means of rendering his Country independent, he became, by the universal suffrage of the people, its ruler & director. I should have repeated with others—Washington is the first of Men, wise, great, & good, whereas as I now view him, he is in truth & reality, honest, prudent, & fortunate, & wonderful to say, almost without ambition; these words are less dignified but not less strong. . . . The World gives General Washington more credit for his retirement from publick life than I am disposed to do. He has for eight years sacrificed his natural taste, first habits, & early propensities, I really believe we may truly say, solely to what he thought the good of his Country. But he was become tired of his situation, fretted by the opposition often made to his measures; & his pride revolted against the ingratitude he experienced, and he was also disgusted by the scurrilous abuse lavished upon him by his political enemies. Later that year, the Listons visited Mount Vernon once again. Washington still appears more amiable & happy since his retirement from a public life. He has had the good fortune to fill the three first situations in America—at the Head of the Army, during the Rebellion against England, The first Magistrate after the Independence of his Country, &, having voluntarily retired, after filling the office of President to the United States for eight years, He is now the first & most extensive Farmer, perhaps on the Continent. 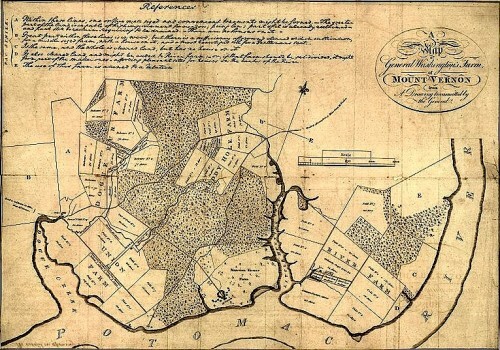 He possesses Lands in several different States, but at Mount Vernon He at present holds four thousand acres, in his own hands. Quotations are from The Travel Journals of Henrietta Marchant Liston: North America and Lower Canada, 1796-1800 (Lanham, Maryland: Lexington Press, 2014) pages 17-19. The map is from a drawing made by Washington himself and can be found HERE. Shortly after arriving in New York City from England on May 1, 1796, Henrietta Marchant Liston and her husband Robert, the new British ambassador, hurried off to Philadelphia, then the capital of the United States. Mr. Liston was anxious to present his credentials to the Congress before it adjourned. Mrs. Liston was just eager to meet the nation’s President. Washington has made to himself a name remarkable in Europe, but of peculiar [special] Magic in America. . . . Washingtons appearance & manners struck me extremely. Tall, Majestic & well proportioned, his face at the age of sixty three rather pleasing, particularly when he smiles. In his air & movements, there was a dignity which the general coldness of his address did not lessen; to me he was affable & kind & when we rose to take leave, requested to see us often without ceremony & reserve. 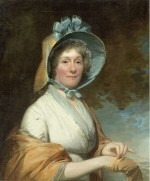 The Listons were in Philadelphia in 1797 for the celebration of President George Washington’s birthday and Mrs. Liston recorded her impressions. [O]n Wednesday last, the 22nd of Feby. the Presidents Birth day was celebrated with all the splendour the Country could afford, Guns were fired & Bells rung—in the Morning the Gentlemen waited on the President, & the Ladies on Mrs. Washington, & were entertained with cake & wine. Ricketts Amphitheater was fitted up & in the Evening a Ball given to about a thousand Persons; the President appeared in the American Uniform, (blue & buff,) with the Cross of Cincinnatus at his breast in diamonds . . . . I went in about seven oClock to the Presidents Box, from which we had a very compleat view of the Company; the Country dances and cotillions were danced verging from the Centre, which admitted of ten, fifteen couples in each, so that three hundred Persons moved at the same time. The American Ladies dance better than any set of People I ever saw . . . . This was not the first time that Washington’s birthday had been celebrated by Americans. Charlotte Chambers had attended a similar festivity on February 22, 1795 (see post here). Although held in the nation’s capital, neither occasion was an official federal holiday; that designation did not occur until 1885. However, the government did call for a “solemn Fast with Sermons Orations &c” to be held on February 22, 1800, two months after George Washington’s death. Quotations are from The Travel Journals of Henrietta Marchant Liston: North America and Lower Canada, 1796-1800 (Lanham, Maryland: Lexington Press, 2014) pages 7-8; and from a letter in late February 1797 in the Liston Papers, National Library of Scotland (also on microfilm at the Library of Congress). 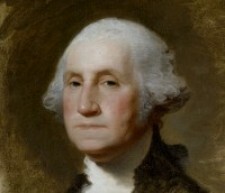 The unfinished portrait of George Washington by Gilbert Stuart (known as the Athenaeum) is jointly owned by The National Portrait Gallery, the Smithsonian Institution, Washington. DC, and the Museum of Fine Arts, Boston. Done in 1796, it is one of the earliest portraits of Washington by Stuart.